After many years of running a do it yourself alcohol injection kit I finally bought one of my supplier's kits. Well, I was thoroughly impressed with his product and I am now a dealer for them! Buy from someone who has actually installed this kit and uses it! Designed to be used on the 86-7 Turbo Regals, the COMPLETE kit has everything you need included to install. Detailed instructions and manufacturer support. 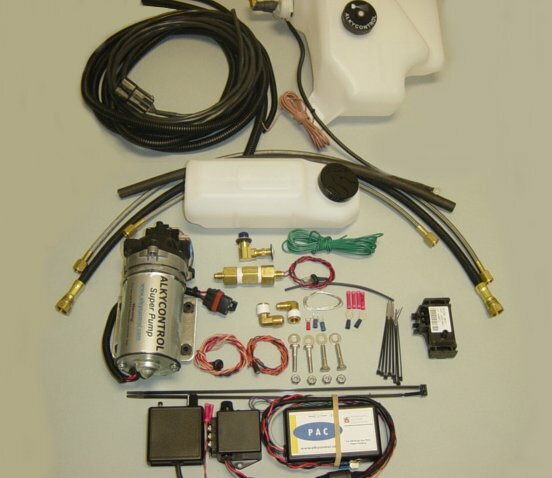 The heart of the system is a specially modified high pressure pump designed to be used with methanol. It easily mounts on the front bumper support and is hidden from view. The brains behind the system is a progressive controller (PAC) that activates the alcohol flow gradually. You can mount it with tie wraps under the steering column or as I did, on the HVAC unit behind the glovebox door. The remote that has a test button on it and also an adjustment knob is easily mounted between the radio pod and the main dash and some people have mounted them in the dash as well. We can assist with custom engraved dash panels if you wish to go that route. The reservoir tank for the alky is a new GM tank that is normally used for coolant! A low level sensor is installed as well as special fittings to connect to the braided hose that supplies the pump. The complete kit includes a 3 bar MAP sensor which is necessary for proper operation of the system. The 2 bar MAP sensor is not rated for higher boost so this is a must have item. The kit is available without it if you already have one. A mini tank is included as well with the complete kit. We also offer an aluminum tank for coolant overflow if desired which must be ordered separately. Want to mount the control knob assembly in your dash? We have custom made panels that allow you to do that in the lower panels of your main dash. Looks just like GM did it. Click here to go to that page, located towards the bottom!